The ethernet switch and router markets have reached an all-time high during the third quarter of 2018, with Cisco dominating industry rivals. New findings from Synergy Research Group highlight a market experiencing average growth of one per cent annually, enough to “nudge” quarterly revenues to over US$11 billion, “surpassing all previous quarters”. “Despite challenges from SDN, NFV and hyper-scalers’ own-design networking gear, the market for ethernet switches and routers is huge and continues to grow, albeit slowly,” said John Dinsdale, chief analyst at Synergy Research Group. 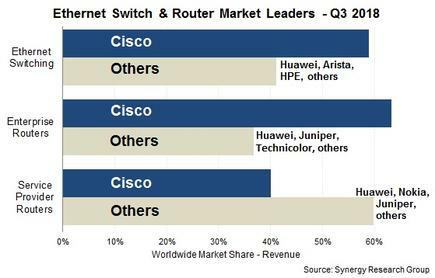 From a vendor perspective, Dinsdale said Cisco’s share of the total worldwide switch and router market stood at 53 per cent, the highest point since 2016. Delving deeper, the tech giant’s market shares in the individual segments ranged from 63 per cent for enterprise routers to 40 per cent for service provider routers. 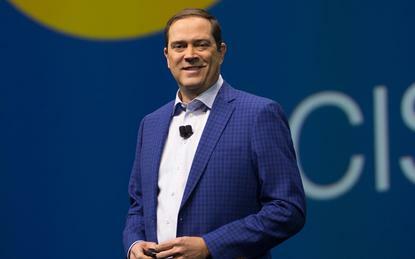 “For the last four quarters in aggregate Cisco’s market share was 50 per cent, two percentage points down from the preceding four quarters,” Dinsdale explained. While the ranking of vendors was different in each of the three main segments, Dinsdale said that in aggregate, Cisco is followed by Huawei, Juniper Networks, Nokia, Arista Networks and Hewlett Packard Enterprise. Combined, their overall switch and router market shares were in the 4-11 per cent range during the third quarter, followed by a “reasonably long tail” of other vendors including H3C and Extreme Networks. “While Arista is the high-growth star and Huawei continues to consolidate its number two ranking in the market, the biggest story is Cisco’s ability to continue controlling over half of the market,” Dinsdale added. During the third quarter, North America remained the biggest region accounting for almost 40 per cent of worldwide revenues, followed by Asia Pacific. According to Dinsdale, Asia Pacific has been the fastest growing region, driven in large part by spending in China, which has benefitted Huawei in particular.